The Siege of Khe Sanh ended for me the moment I got on a CH-46 and flew to Dong Ha. As far as I can recall, that happened around April 4, 1968. As the big bird swooped off, I looked back at Khe Sanh and began to let the notion that I had survived soak into my soul. I was gone. I hopped flights from Dong Ha to Phu Bai to Danang to Okinawa to El Toro and finally to Arizona on April 11. No more killing. No more hiding in a hole. No more whiz bang smash crash kaboom from incoming; except in my dreams. As I traveled from the war to home and then from bar to bar to bar in the United States, I fought like hell any attempts to wonder about what was going on at Khe Sanh. I read the papers every morning and read the daily death tolls but I had already managed to jam a metaphorical arm’s length between the Khe Sanh Combat Base and me. The last few days in Khe Sanh I’d promised Alvarado that I’d contact his uncle as soon as I returned and I promised Jake the Snake I’d send him a fifth of Chivas Regal and I suspect I promised a lot of other things to the men I fought with. But as soon as my legs steadied on the tarmac at El Toro, I let all the promises drain out of me along with a ton of the tension that tied my neck in knots. I immersed myself in the glory of home, my buddies, the alcohol, and the women, not that I could get close to them or anyone, family or otherwise. But I tried to forget it all and I for sure didn’t wonder what was happening at Khe Sanh. For me it was kaput, finis, dead, over. American warrior on Hill 471. But it wasn’t. Men were still being killed and maimed at my old homestead. Besides the warriors still trapped inside the combat base and surrounding hills, elements of the 1st and 3rd Marine Regiments and the United States Army’s 1st Air Cav, in what was named Operation Pegasus, were driving up Route 9 in an attempt to relieve Khe Sanh. On April 6 while I was in Phu Bai turning in my gear at the battalion rear, Marines and Corpsmen from Bravo 1/26 and Delta 1/26 went out on a patrol and picked up the remaining bodies of the Bravo Company men who were killed on February 25. On April 6 through April 8, Marines from 2/26 were moving off of Hill 558 to drive the enemy from the field and were engaged in three days of vicious combat. On April 13, two days after I got home, Felix Poilane, the French national whose family owned one of the coffee plantations at Khe Sanh, was killed in a plane crash while coming back to Khe Sanh. That day, I was already running around with my old college roommate drinking cases of Coors. On April 14, Operation Pegasus was complete and Operation Scotland II began, and the main breakout by the Marines of Khe Sanh started. In Operation Scotland II, elements of the 26th and 9th Marines began to drive into the surrounding country and maul the North Vietnamese Army. 1/9 hit Hill 689. Marines from 3/26 assaulted Hill 881-N, which had always been a symbol of the North Vietnamese Army’s ability to battle toe-to-toe with us. While all this fighting was going on, I was boozing it up on Cinco de Mayo in Nogales, Mexico, and traveling to Phoenix to hang out in honkytonks. Then I was with 5th Battalion Recon at Camp Horno, and all the time, for me, Khe Sanh was over. Later, while I was rappelling on San Clemente Island and running along the beach at Camp Pendleton, the Marines were still fighting and dying at Khe Sanh. On June 18, Operation Charlie began with the abandonment of the Khe Sanh Combat Base a primary goal. To get this job done, more Marines died. 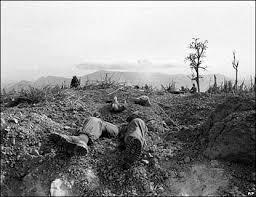 Khe Sanh was destroyed by our own forces. On October 9, 1968, a ceremony was held at Khe Sanh—or more specific, the base’s remains—to memorialize the men who died defending the place. By the time of the Khe Sanh ceremony in October, I had been transferred to San Diego to begin a year of . . . even though I was still a Marine . . . living somewhat like a civilian. After the Siege ended, over 600 Marines, Army, Navy and Air Force personnel perished in Operations Pegasus, Scotland II and Charlie. That number is much larger than the number of men who died during the Siege itself. To be honest, in the back of my mind, while I lived my stateside life, I knew men were dying over there. But I was trying to stuff all those thoughts and the memories they led to. But some encounters made it impossible to hide from the recollections of my time at Khe Sanh. For instance, one of the men I served with as a radio operator at Khe Sanh was stationed with me at San Diego. We had shared a bunker for over a month during the Siege. In San Diego we never spoke of our time in Vietnam. I suspect he was doing the same thing I was, trying to bury the recent past. But every time I looked in his face, his weary eyes talked to me about the days and nights spent cooped up like rats, the times we went outside the wire and assaulted NVA trenchlines. I was also stationed with a Marine who was an engineer with the unit that blew up the Combat Base during Operation Charlie. One night he described to me the action, explosion by explosion. It all made me sick with disgust. All those men who had died before, during, and after the Siege . . . thinking of them made me think, what a waste. Those brave and frightened men who died during the relief and the breakout, men of the 1st, 3rd, 4th, 9th, 11th, 12th, 13th and 26th Marines, 3rd Recon, and associated support units, pilots and flight crews. Seabees and Corpsmen and pilots and air crews from the Navy, pilots and air crews with the Air Force, pilots, air crews, special forces and ground-pounders with the United States Army. People like the photographer Robert Ellison, killed while serving as a civilian photojournalist. All the ARVNS and the local Bru montagnards who fought with us and died. Yes, it all made me sick with disgust. I think a lot of fellow Vietnam veterans still battle memories of their time in Vietnam in the 1960s and 1970s. For their sake, I hope the sacrifices made on both sides accomplished something beyond the death and despair. If you or your organization would like to host a screening of BRAVO! in your town this coming summer or fall, please contact us immediately. Marine Michael Phillips flew re-supply choppers into Khe Sanh and the surrounding hills during the siege. Here he tells us what it was like. My name is Michael Phillips, and I was a Marine Corps pilot with HMM-364 Purple Foxes helicopter squadron during the siege at Khe Sanh. Every day during the siege, we sent 8 CH-46’s to resupply the hills and Khe Sanh between 24 February 1968 until 9 April 1968. This came to be known as the “Super Gaggle” in aviation history. Our day began with a 05:30 briefing at Phu Bai, then up to Quang Tri to be briefed again by General Hill. After that we flew over to Dong Ha and picked up our externals. Since it was IFR (Instrument Flight Rules) at Dong Ha, our first aircraft took off on a heading for Khe Sanh, aircraft # 2 took off 10 degrees to the left, aircraft # 3 10 degrees to the right, etc., until all 8 were airborne. We normally punched out around 8,000 feet, on to Khe Sanh where we would orbit for 30-40 minutes while the artillery, F4 Phantoms, A6 Intruders and A4’s provided gun support for the hill that we would resupply. One of our biggest concerns was that of a mid-air collision. We had so much air support that F4’s were constantly zipping in front of us. At that altitude and at our weight, we barely had enough power to maintain elevation, so when we flew thru their exhaust it was not unusual for us to lose control and drop 3-400 feet prior to regaining control. When the command was given for us to begin our run, we had to lose 8,000 feet of altitude but still maintain enough power to land at the LZ. On the way down our gunners would begin firing their .50 caliber guns, careful not to hit the Marines on the ground. The NVA AK-47 was not very dangerous to us until we reached around 1,500 feet in elevation above the LZ. The major problem for us was maintaining proper spacing between aircraft, or we might have to attempt to hover at 900 feet. We simply did not have enough power to do so. It was essential that aircrafts #1, 2 and 3 get on to the hill or the LZ at Khe Sanh and off without wasting any time. Or else the balance of the flight was trying to hover, and a pilot could not do so. Hill 881 South was our most difficult as we owned that hill and the NVA owned 881 North. We could always count on intense fire from there. One hill that did not receive much publicity was 558. This hill was in a slight ravine and there must have been 100 mortar tubes there. Keeping them supplied with ammo was a fulltime job. After we completed the resupply we left for Quang Tri, refueled and flew back to Phu Bai. Every Marine base in I Corps was surrounded. 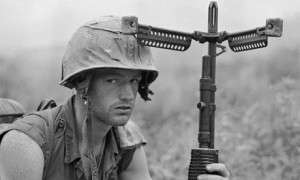 When we got back, our gunners took the .50 caliber guns out of the A/C down to the perimeter as we got hit by the NVA each night. Our crew chiefs worked all night to fix the battle damage to our A/C. We could have done nothing without the crew chiefs. They were superb. It was not unusual for us to take 50 rockets at a whack. Afterwards the NVA would always put a round in every half hour, so out to the bunkers we went. This ensured that we got very little sleep. Flying that CH-46 lacking sleep was a chore and all of our pilots became extremely rude, ugly, tense and it did have an effect on how efficient we were. Approaching Hill 881 South (or any of the other Khe Sanh LZ’s) was somewhat more sophisticated than I mentioned earlier. When we began our descent it always reverted back to the individual pilot’s skill and his ability to shoot a good approach. Controlling the rate of descent, controlling spacing, controlling air speed, maintaining turns (RPM’s), running out of ground speed and altitude at the same time over the LZ was imperative. Dropping the external as “softly” as possible was a never-ending challenge. If any of the A/C in front of you did not do these things, you had to make adjustments, quickly. We simply did not have enough power to hover at 1,000 feet so sometimes one had to drop out of the sequence and go to the Khe Sanh Combat Base airstrip to hover, then air taxi to the hill. This was not a good thing as the Combat Base runway always took a lot of rockets and mortars, and you were exposed to more fire than desired. If one A/C screwed up, overshot the LZ, he had to come to a complete hover, back up to the zone, bounce around some; this took time. It was time that the A/C behind him did not have to sacrifice. The CH-46 does not stop on a dime. In our haste to get in and out, sometimes our airspeed was excessive. It was adjustment time for everyone behind the pilot who was trying to get into the LZ. Prior to flight school, I went to Basic School in Quantico. There I studied tactics, explosives, rifle range (M14) .45 pistol, everything that a Second Lieutenant is supposed to know. (Not much, huh?) As a result I had many friends that were 0311, and it provided me with a very good understanding of what the grunts were going through. Since I was not there with them, I could not actually experience in depth their plight, but I did have enough knowledge to admire their courage, never giving up, never leaving a wounded man in a hot zone. During and after Tet, I had occasion to fly many medevac missions. Some of these required that I land in a rice paddy, 100 meters from the tree line where we were taking intense fire. The plexiglass cockpit and 1/8 inch aluminum skin of the A/C did not slow down an AK-47 round, and we paid a price. I am proud to say that in the Marine tradition, we never left a wounded man in a hot zone. Never. He was coming out, and was going to be on a hospital ship in 20 minutes. It was not that I was a hero, all of our pilots, and all of the pilots from other squadrons did the same. All in a day’s work to support the Private with a bayonet on the ground. The same was true if one of our recon teams was compromised. They might have to run for a mile to find a LZ big enough for us to land, but we took them out. Probably more than you wanted to know about the day-in, day-out life of a CH-46 driver. You guys were the greatest, a shame that none of you (us) ever got the recognition that we deserved. On a separate note, DVDs of BRAVO! are now for sale at https://bravotheproject.com/buy-the-dvd/. We have a page on Facebook. Please like us a https://www.facebook.com/Bravotheproject/. This is the season of May Day when the flowers bud and a sense of new life comes to mind, the scent of lavender, the new green on aspen trees, the longer days announced by the five-thirty-AM song of the mating robin. May Day is a big holiday in some countries with strong legacies of unions and socialism. Spring and May Day (as do many other stimuli) make me think of my early days in Vietnam and what we, the men who fought at the Siege of Khe Sanh, were doing not long before our lives collided with the mayhem that was Khe Sanh. On May 1, 1967, the 1st Battalion 9th Marines was on Operation Prairie IV in the Dong Ha area of operations. The 3rd Battalion 26th Marines was operating around Phu Bai. The 2nd Battalion 26th Marines was on Operation Shawnee with the 4th Marines in Thua-Tien Province. The 1st Battalion 26th Marines…my battalion…was operating in the Hill 55 region southwest of Danang. I arrived at Hill 55 sometime towards the end of March 1967 or early April 1968. I recall the smells and the tastes in the mouth, the burning heat, the occasional night-time mortar attacks. All of it was new and exciting. Seeing bamboo vipers and lepers and elephants and the hope of seeing tigers, looking at the punji stakes and booby traps, and of course getting a chance to fight the enemy. And why not, that was what we were in Vietnam to do. To fight the enemy and Communism and to keep it from spreading around the world. Whether we were successful or not at stopping Communism I will leave to the reader, but for me, there it was. I wanted adventure, and today I think I was in Vietnam because I wanted to fight. And early on I got my chance. Not long before the 1st of May, 1967, a Seabee drowned in a river not far from Hill 55. I do not know the river’s name because it was all too new to me…the smells, the men I served with, the environment. Two CH-46 helicopters showed up as our platoon—2nd Platoon, Bravo Company, 1st Battalion 26th Marines—queued up with weapons, flak jackets and a lot of excitement. The platoon sergeant, a gunny with a championship handlebar mustache and toting a Browning semi-automatic shotgun, told the other new guy and me that we weren’t going on this Sparrow Hawk operation because we weren’t “real” Marines. I remember feeling the disappointment of being left out, like when the girl you hankered after in high school started hanging out with all the older guys. As we sulked off towards our hooch, the gunny called us back and motioned us onto the chopper. I have no idea what transpired in those moments after we turned away from the whapping chopper blades and the faces of our fellow grunts—faces taut, eyes round and large, and I imagine now, dry mouths. Regardless of what was said to the gunny or why he changed his mind, I felt like a kid full of balloons. Without questioning the why of our redemption as “real” Marines (because as Marines, “Ours is not to question why, ours is but to do and die”), we crammed ourselves on the CH-46. How long we were in the air, I have no sense, but I doubt it was very long because all I recall was looking at that other Marine Corps-green CH-46 chopper flying behind us, the green jungle below, the grim faces of the silent men jammed into the body of the airship, and as we descended, the wide river and the big sand bar in the middle of the water that was our LZ. The two choppers settled into the sand and being the last man on, I was first off. I knew what to do. I’d show that damned gunny that I was a “real” Marine. I knew we needed to get off the chopper and establish a perimeter around the helicopters until we had all disembarked. As I ran across the white sand, I noticed little eruptions at my feet. I heard things snapping past my head and an instant later I heard hollow pop sounds coming from a tree line off to our front. I slowed to get a better idea of what was making the sand erupt as well as those sounds. As if to show me what to do, he cranked off a short burst from his M-16 and then rolled over and started talking to the other new guy. I started shooting, too. All of a sudden everybody jumped up and got on line and we charged that tree line shooting into the jungle, and when we burst into the tree line there was nothing there but a ten-foot-wide strip of vegetation, and beyond, more white sand and no sign of the enemy. We got the word to assemble back on the landing zone and as we boarded the two CH-46s we hooted and hollered and the gunny was gripping hands and yelling stuff I don’t remember and he even hugged my shoulder like I was a “real” Marine. Riding back to the company’s base of operations, I mused on those bullets that had been hitting at my feet, snapping by my head. I was lucky no one shot me. And later, at the siege, I was lucky many times. Very often not at the wrong place at the wrong time. 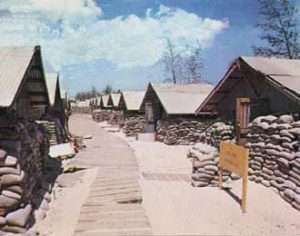 I survived to go home sometime in early April 1968, just before the siege ended. But my comrades who still had time on their tours of duty went on to endure more at Khe Sanh and then beyond. On a separate note, BRAVO! will be screened twice in Sonora, California, on Armed Forces Day, May 18, once at 5 PM and again at 8 PM. These screenings are being ramrodded by Khe Sanh brother Mike Preston and presented by the Vietnam Veterans of America Chapter 391 and Columbia College. See more details about the screenings here. Please help us pack the house; it is a fundraiser for the local VVA chapter. On May 28, 2013, BRAVO! will be screened at Soledad State Prison (Salinas Valley State Prison) in Soledad, California. This screening is not open to the public but is remarkable because of the large number of veterans incarcerated there who will be able to see BRAVO! If you would like to see BRAVO! screened in your area, please contact us. From Elko, Nevada, where there is a threat of snow, news on the news of Bravo! Common Men, Uncommon Valor. Read co-producer Ken Rodger’s guest blog posted at James Goertel’s All Lit Up, at NextTV, on the genesis of the movie from his escape from Khe Sanh until today, February 1, 2012. The post is at http://bit.ly/A001S1.